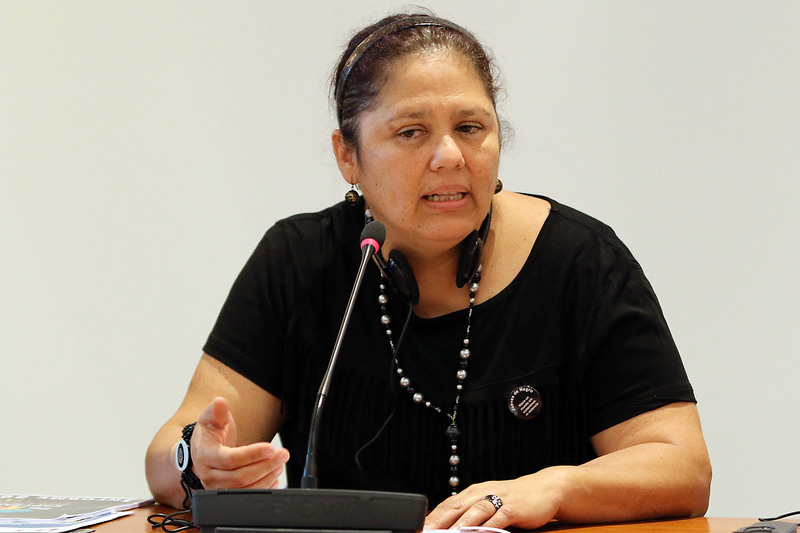 (LWI) – Testimonies by human rights’ defenders are an important component of an annual advocacy training on women’s human rights, organized by faith-based organizations (FBOs) at the Ecumenical Center in Geneva since July 2015. The local experiences inform positions and action at the international level and shed light on the often difficult contexts in which churches and other civil society organizations work. The President of the Guatemala Lutheran Church Rev. José Pilar Álvarez Cabrera shared at the 3-7 July training his own experience as part of a social movement made up of different actors, including church representatives. They have been defending access to land and water for indigenous people and peasants in the Chiquimula mountain area, eastern Guatemala. His leadership in the movement and support for human rights’ defenders triggered long years of persecution, threats and criminalization, including imprisonment in 2009. “Indigenous communities declared themselves that they would defend their water because landlords were hindering communities’ access to the land,” he said in his testimony. Indigenous communities declared themselves that they would defend their water because landlords were hindering communities’ access to the land. Dora Arriola, program officer at Jotay, a local organization in Guatemala, spoke of the need for FBOs’ collaboration and support to civil society in countries where private investors move in and flout agreements meant to safeguard natural resources for the common good. “It is important to create networks among us. Lutherans must also work with Catholics and indigenous people and others to defend our resources and human rights,” said Arriola. The Lutheran World Federation (LWF) Central America program is among the six organizations that established Jotay in order to enhance civil society advocacy on issues such as gender justice, sustainable natural resources, rule of law and citizen security. Jotay in the indigenous Maya Kaqchikel language means “Regeneration of life”. Arriola emphasized the key role of the Universal Periodic Review (UPR) process, through which UN member states themselves report on the human rights situation of respective countries. 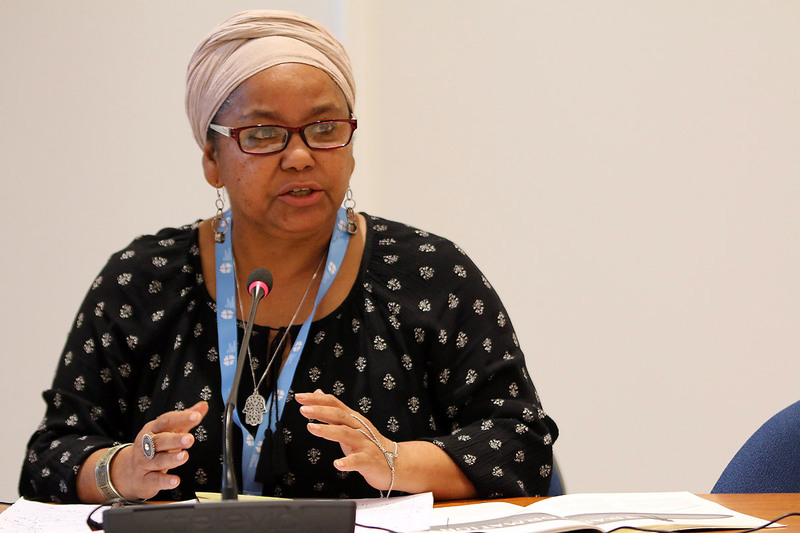 She said it was critical for non-governmental organizations to keep monitoring the states who are reporting and preparing submissions to the Office of the United Nations High Commissioner for Human Rights. Peace and anti-apartheid activist Fatima Schwartz, deputy director of the Institute of Healing and Memories in Cape Town, South Africa, said it was essential that those who need healing from emotional and conflict wounds are heard. “The institute works on the basis that everyone has a story to tell and every story needs to be heard, acknowledged, and respected,” she said of the institute founded in 1998 to look into the ravages of apartheid and racial inequality. Being heard is the first step to personal healing as well as healing of interpersonal relationships, Schwartz explained. By exploring and acknowledging the emotional wounds carried by nations, communities and individuals, workshops offered by the institute enable people from diverse backgrounds to confront sources of alienation and conflict. At the training, delegates heard from panel speakers on FBOs’ international advocacy in women’s rights. This year’s meeting focused also on the role of women in radicalized contexts, the rise of fundamentalism and the instrumentalization of religion. Like each year, delegates attended a CEDAW session at the UN Geneva offices. The LWF co-hosted this year’s training with Church of Sweden, Finn Church Aid, Mission 21, and the World Council of Churches. “The trainings are paying off,” says Maria Cristina Rendón, LWF program assistant for Women in Church and Society. “We have trained women and men in over 60 countries. They have been empowered to bring their local concerns to the global arena. The United Nations treaties are not anymore mere agreements: they are the tools to hold their governments accountable and to set the road toward the full enjoyment of human rights for women,” she added. The delegates at the annual training included staff working in the area of human rights in the Evangelical Lutheran Church in Tanzania; the Lutheran Development Service in Liberia; and LWF country programs in Angola, Central America, Haiti, Kenya and Myanmar.